Kim didn’t have any trouble at the bus station – which doesn’t really make for a very exciting story. She didn’t even have any nasty parasitic wounds like Frank did. Once again I am sitting on the balcony at TechnoServe’s Arusha offices on Themi Hill – traffic thuds into the potholes and speed bumps on the road beyond, with the occasional crunch and tinkle of bottles as a truck leaves with its consignment from the nearby Pepsi bottling plant. Birds tweet in the trees and there is a light breeze. A beautiful sunny day. But I am sitting amidst dust which is kicked up by the road and turns my bogeys black and grey. We have moved into Mary’s…servant’s quarters I guess you would call it. Picture attached. 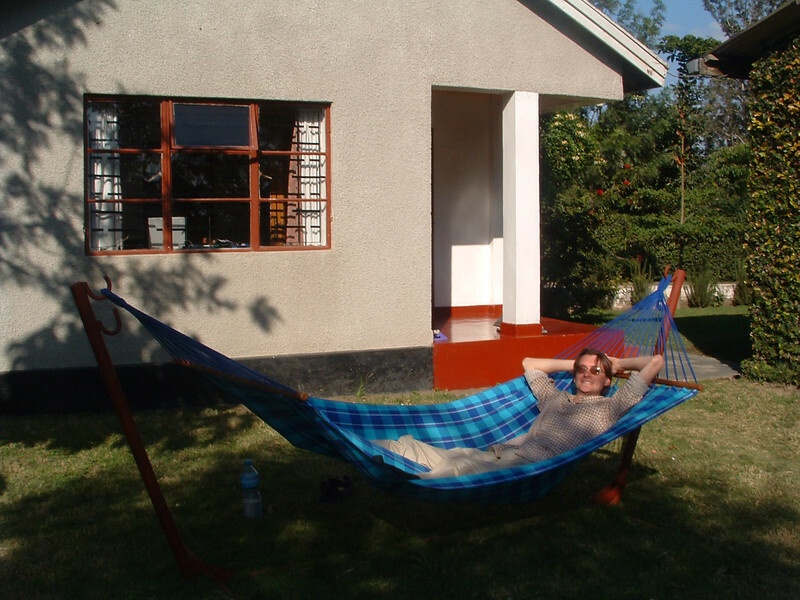 That is me in the hammock – gift from The Prostate Cancer Charity which I am finally using! Some fundis knocked together that frame for it. Four rooms – Bedroom, Front, Kitchen and Bathroom. The bathroom and toilet open directly onto the kitchen… For this we pay $150 a month. On Saturday we bit the bullet and bought a fridge. Swallowed up all the money I have earned so far in Tanzania – but Mary will get to keep it when we leave, so there is a month’s rent in the fridge. How much does one pay for a fridge in Tanzania? We paid $340 for the fridge then an extra $25 for a voltage regulator to stop it blowing up or something. Eek. After that spend we are still on the lookout for a car. Jongo has found us a couple of cars to look at – one of which he assures us is a racing car that seats six. Not sure about that. The other is a more respectable sounding Toyota Mark II. Then the folk up at Uru have tracked down a Startlet, but it is a bit chinese whispers, in that I haven’t yet been given the phone number of the person selling it, and have instead had lots of instructions of calling various chaggas. May be seeing this elusive and tiny car on Friday – surely the dik-dik of the automotive world. Yuki found a Landrover 109 ex British Army Ambulance on sale which we will check out tomorrow – it has beds in the back – may be the safari vehicle of our dreams… Or just another step closer to bankruptcy and feeding ourselves to the hyenas… Having seen a picture of one of those on the website linked to above – I must have!